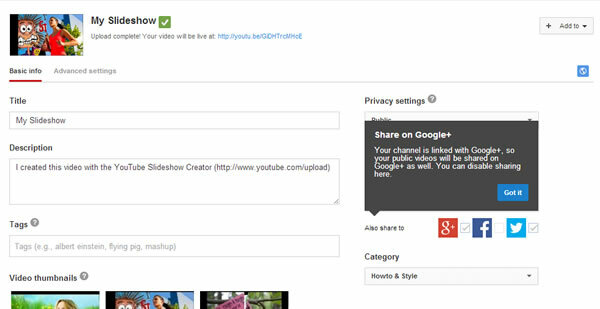 Find out how to upload photos to youtube and share them as a picture slideshow! Yes, youtube is not only for videos but you can use it to upload your photos as well. The even more good news is that you can do this directly from Youtube without using any other third party tool to convert your images into a video format. On the top right corner there is an UPLOAD button, click it. If you are not already signed in to Youtube, you need to sign-in with your Google Account. You can then choose which photos to use in your video. Notice that since the Youtube channel is connected to your G+ profile, you have access to all the images available in your G+. If the images you want to use are not available you can click the Upload Photos and upload photos from your PC. In this example I will use images from my PC so click on the UPLOAD PHOTOS and select a couple of images from your PC. You are almost done! What is more exciting is that you can add easily several features to make your video slideshow even better. As you can see from the screenshot below, youtube already suggests a number of audio tracks to accompany your slideshow (if you want a different track just search of it using the search function below the suggested audio). Besides audio, you can also select the SLIDE DURATION, SLIDE EFFECT and TRANSITION effect to use between images. When you ready to go live click the Upload button. Unlisted – Only the persons who have the video URL can view it. Private – You choose which people can see the video. That’s it, within minutes you can learn how to upload photos to youtube and share them with your friends and family or keep them for private use.